…they don’t have any proper Japanese Doll Festival dolls to celebrate with, but they found an origami Emperor and Empress! Thank you very much…this is bare bones, but we enjoyed doing it. Beautiful! Love your kimono’s girls. Thanks, the girls are happy to wear their fancy kimono for their special day! so sweet – the girls have more kimono than many Japanese I know. They are gathering Kimono, though don’t have one each yet! We also now have two yukata, which may appear later in the hot weather. This photo is absolutely precious. You are amazing. Arianell and Min are quite photogenic, I admit it! 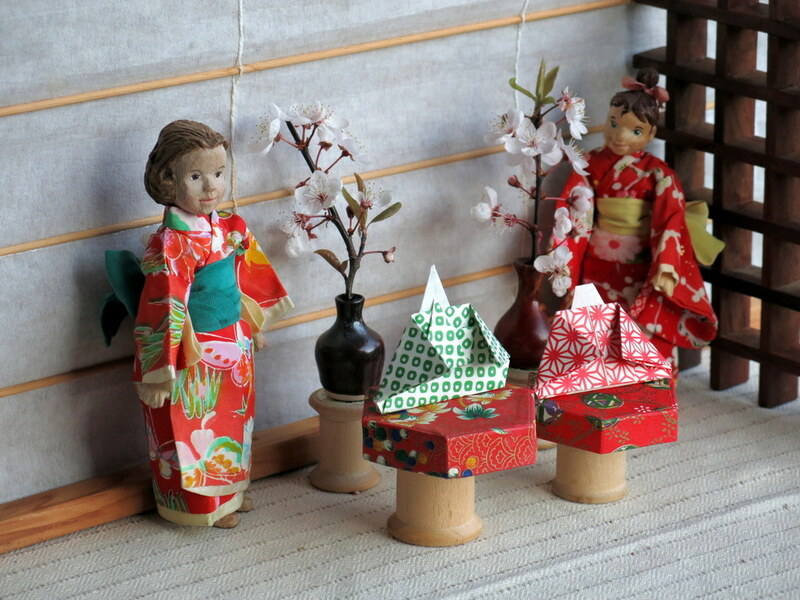 They enjoyed having a special holiday just for them, and they are glad I remembered that I could make them origami characters for Hinamatsuri. The girls think that origami is fun, and they are hoping to learn how to make more interesting items for the Hitty cupboard.